On February 14, love will be on lips—and billboards—everywhere! 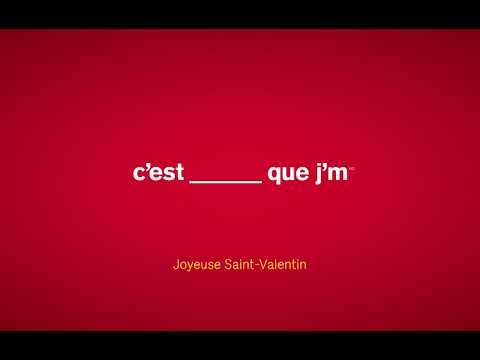 To celebrate Valentine’s Day, McDonald’s Canada will turn things over to lovers and give them centre stage on billboards throughout Montreal and in their Snapchat and Instagram stories. Being close to people and offering them a place to gather are at the heart of the McDonald’s brand, and served as inspiration for this campaign by Cossette, where their iconic “I’m lovin’ it” signature will be transformed into a personalized declaration of love. Starting today, members of the public can declare or renew their love by submitting the name of their sweetheart as a comment on the McDonald’s Canada Instagram account (in English or French) or in a Snap sent to the brand. On Valentine’s Day, some of the messages received will be developed into billboards by the agency for McDonald’s. Cossette was named Agency of the Year by Strategy magazine in 2016 and 2017. The agency currently has offices in Halifax, Québec City, Montréal, Toronto and Vancouver, and has been making strides to become a major player in the global advertising community. To learn more, visit cossette.com.